The foreign tourist visit to all States and UTs has been increasing over the years and in the year 2016,the visits by foreign tourists registered a growth of 5.92 per cent over 2015, according to a statistics report by Ministry of Tourism. The report says that number of foreign tourist visits to States/Uts during last 13 years has been registering an increasing trend overall, except for marginal decline in foreign visits in the years 2009 and 2012. 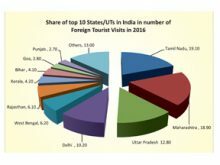 The top five states in foreign tourist visits in 2016 were Tamil Nadu (4.72 million), Maharashtra(4.67million), Uttar Pradesh (31.53 million). Meanwhile, the report says that, there has been continuous increase in domestic tourist visits to States/ UTs with a compound annual growth rate (CAGR) of 13.03 per cent from 1991 to 2016. The top five states in domestic tourist visits in 2016 were Tamil Nadu (343.8 million), Uttar Pradesh (211.7 million), Andhra Pradesh (153.2 million, Madhya Pradesh (150.5 million) and Karnataka (129.8 million).